Jellyfish and jelly-like animals share centre stage with plastic on prime time TV. Blue Planet II, with its visually-stunning imagery providing a window into some of the amazing creatures inhabiting our oceans from the darkest depths to the sunlight surface waters, has certainly captured the imaginations of its audience. I suspect that for many it reminds them of when they were children, pressing their faces against the window of a favourite sweet or toy shop, admiring the contents inside! Much of Blue Planet II has focussed on the charismatic megafauna - the whales, dolphins, sharks - as well as fish, and certainly the latest episode of Blue Planet II, Big Blue, showcased spectacular behaviours and interactions taking place in the vastness of the open ocean. As I sat down to watch the programme with my youngest daughter, we were treated to spectacular scenes of a family of sleeping sperm whales hanging vertically in the water column, the giant bait ball and ‘boiling sea’, a succession of sharks stripping the whale carcass of its blubber, and a baby turtle seeking refuge among the debris floating at the ocean surface. Who could forget the infamous yellow plastic ducks being transported 1000s of miles on the ocean circulatory system?! Through modern tracking devices and stable isotope techniques, we are learning about the fantastic journeys juvenile turtles, sharks and other megafauna undertake. All these scenes were awe-inspiring, of course, but what I was most excited about (admittedly as a jellyfish ecologist) was the inclusion of jellyfish and the colonial jellyfish-like Portuguese man o’ war, Physalia physalis, sharing the limelight with the charismatic megafauna. As Sir David Attenborough informed us “Over half of all animals in the open ocean drift in currents”, in other words the plankton (derived from the Greek planktos ‘wandering’ and first used by Victor Hensen in 1887), of which the jellyfish are members. Let us not forget that phytoplankton and zooplankton form the basis of marine food webs and thus play a fundamental role in feeding the oceans’ inhabitants. Maybe I am biased, but it would have been nice to see some the fantastic diversity of microscopic zooplankton included in this episode. Returning to the topic of jellyfish and jelly-like plankton, we were told “When by lucky chance they encounter a patch of sea rich in plankton their numbers explode”, during which high densities of the moon jellyfish, Aurelia sp., and sea nettle, Chrysaora sp., were seen pulsing across our screens. At the time of Blue Planet I, 20 years ago, there were relatively few jellyfish researchers worldwide, but since then interest has grown considerably, mainly as a result of these population ‘explosions’ or bloom events. I recall the contrast between attending the 1st International Jellyfish Blooms symposium in 2000 which had ~50 scientists and the latest conference in 2016 which had over 200 attendees from 6 continents, many of whom were PhD students and early career researchers. So why the interest? In the early-mid 2000s a paradigm developed that jellyfish blooms were increasing throughout the world’s oceans and that anthropogenic climate change and human activities such as overfishing, eutrophication, species translocation and coastal sprawl, were to blame. Many scyphozoan jellyfish such as Aurelia and Chrysaora, as well as the mauve stinger Pelagia noctiluca, the giant jellyfish Nemopilema nomurai, and the closely-related ctenophores or ‘sea gooseberries’, do occur at some times and in some places in highly elevated concentrations as they blooms, accumulate or aggregate. Key life-history and physiological traits such as high water and low carbon contents, voracious appetites, asexual reproduction and hermaphroditism, enable them to grow and reproduce rapidly when conditions are favourable, while flexibility enables them to survive adverse conditions of low food, hypoxia and variable temperatures. Dense populations of jellyfish can alter the flow of carbon through food webs, diverting energy away from higher trophic levels. Mass depositions of dead jellyfish, so called ‘jelly falls’, have been reported to deposit up to four times the annual carbon input to the deep sea bed. And then there is the negative socio-economic impact to fisheries and aquaculture, beach tourism and power provision. But sometimes we are blinkered by short-term goals and observations. It always frustrates me to see sensationalist and negative headlines describing jellyfish as ‘aliens’ or deadly blobs’ whenever they wash up on a beach - which actually happens most years. Blooms are not a new phenomenon, and there is evidence of jellyfish depositions in the fossil record (I know, it seems strange when they don’t have hard structures such as bones, shells or calcareous exoskeletons!). Recent research has identified that populations oscillate at global, regional and local spatial scales, with jellyfish research focussing on disentangling the interactive effects of functional biology, ecological interactions, genetics and oceanography in shaping populations. 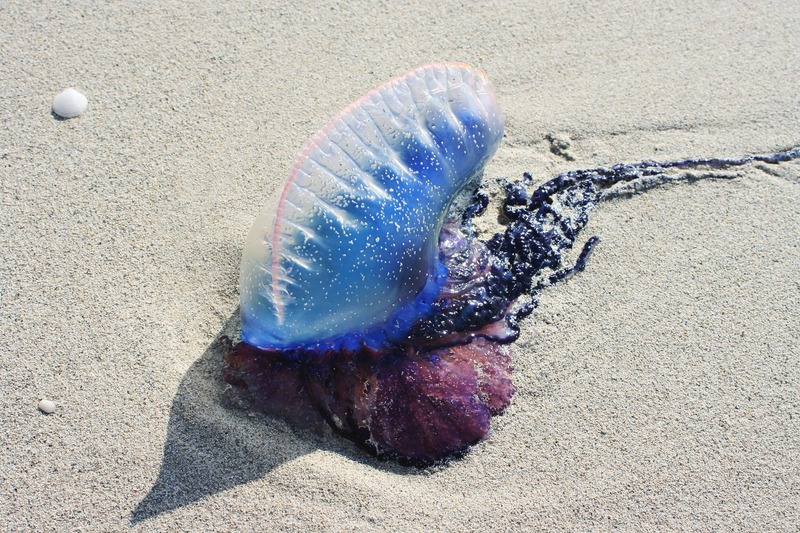 A Portuguese man o' war (PMOW) stranded on a beach. This autumn has seen large numbers of PMOW washed up all along the south-west coast of the UK, most likely blown in by Atlantic winds. So finally to plastics in the ocean, a form of marine pollution that has come to light in recent years following the discovery of the infamous Great Pacific Garbage Patch in 1997. Turtles are renowned for confusing plastic bags for their jellyfish prey, but now we see disturbing and graphic images of birds, seals, sharks and turtles entangled in plastic, and rubbish accumulating on the deep-sea floor. Just this year a study revealed that a third of UK-caught fish and shellfish including favourites such as cod and haddock contained plastic fragments. Microplastics, comprised of nurdles, microbeads and microfibers, have accumulated in the oceans since the 1960s, and there is a growing realisation that they may also enter the food chain via consumption by zooplankton, which are in turn preyed upon by fish, and so on. A series such as Blue Planet II is made to educate as well as inspire, and it is timely to see the issue of plastics in the oceans brought to the wider public’s attention, as all of us are encouraged to change our habits regarding the use of certain cosmetics, plastic straws, balloons, plastic bottles, and even glitter. Marine ecologist with a particular interest in understanding the causes and consequences of jellyfish bloom events.